On the other hand, I also know the reality of being charged with the task of writing a donation letter.Â Where do you start?Â What should be included in the letter?Â It can be a tough assignment.Â While the largest nonprofits hire professional writers and consultants, I would guess that the majority of organizations must write these letters themselves, in addition to their other duties.Â A template of some sort will help you get started. There are certain elements that should be included in every fundraising letter.Â Some of the sections listed below might seem obvious, but I have read quite a few letters that mistakenly leave out an important point. 1. Name of Organization & Contact Information – It should be perfectly clear what organization is sending the letter.Â You can print your letter on the organization’s letterhead or paper that was printed just for this particular letter appeal.Â Â Either way make sure that your organization’s name, its logo, address, phone number and website address are included. 2. Date – It is important to include the date of the mailing.Â If you are using bulk mail, be aware of US postal regulations that require the date on the letter be the same as the mailing date.Â If you are unsure of what day the letters will actually go to the post office, just include the month and year.Â This way as long as you mail during the month the letter will still be in compliance with US Postal requirements. 3. Address of Donor -Â Traditionally an “inside address” (the address where the letter will be delivered to) was standard on all business correspondence.Â This is not quite as strictly followed today.Â Many letters leave off this piece of information.Â However including the recipient’s address on the letter itself can be an advantage when it comes to mailing.Â By using envelopes with see through windows it can make the task of stuffing the envelopes faster and easier. 4. Salutation – Going through my continually growing stack of letters that I get from non-profits, I am surprised to see so many organizations still using “Dear Friend” instead of the recipient’s name.Â It is much more personal and appealing to the reader to get a letter address to them by name. Depending on the audience you may wish to use last names only or first names, i.e. Dear Mrs. Smith, or Dear Jane.Â Whether you are using a printing company, mail house or printing the letters yourself, a mail merge can be used to automatically insert the names. 5. Your Story -Â The components in 5-7 all reside in what is traditionally called the body of the letter.Â This is the core section where you strive to connect with the reader, show them why the cause matters and what benefits they gain by donating.Â In other words, what difference will their contribution make? Organizations who have multiple project areas may be inclined to include information about everything they do in one letter.Â However, this can overwhelm the reader.Â Instead focus the letter on a particular project or theme.Â One of the most successful ways to get your message across is to describe a story of a specific person or situation that your charity has helped. Always remember to include stories that will engage the reader, not just show off accomplishments. 6. Ask for a donation – Sending a donation request letter is for nothing if you do not ASK for a financial gift.Â Encourage the reader to make a donation by making it clear what you are asking for and how to respond.Â Include a reply envelope to make it even easier for them to respond. 7. Say thanks – Show gratitude in advance of the reader making a donation.Â If they have given in the past acknowledge how their previous contributions have helped make a difference in the cause. 8. Closing – Traditional closings such as “Sincerely” or “Kind regards” are acceptable, but you may find other closings that would fit your situation well. 9. Signature – Each letter should be hand signed individually, or a scanned image of the signature inserted into the document before printing.Â Do not use a script font instead of a signature and do not leave the signature area blank. 10. Name – Beneath the signature spell out the full name of the person the letter is from. 11. Title – Don’t assume that your readers know who this sender is.Â Even if you are sending to previous donors, include their full title. 12. P.S. Statement – Reinforce the message with a PS statement.Â You may wish to state the date the donation needs to be in by or reference the story or project mentioned earlier in the letter. An example of a letter that utilizes all of these 12 elements is a special appeal letter for Christo Rey High School in Sacramento.Â You can also view a larger version here. 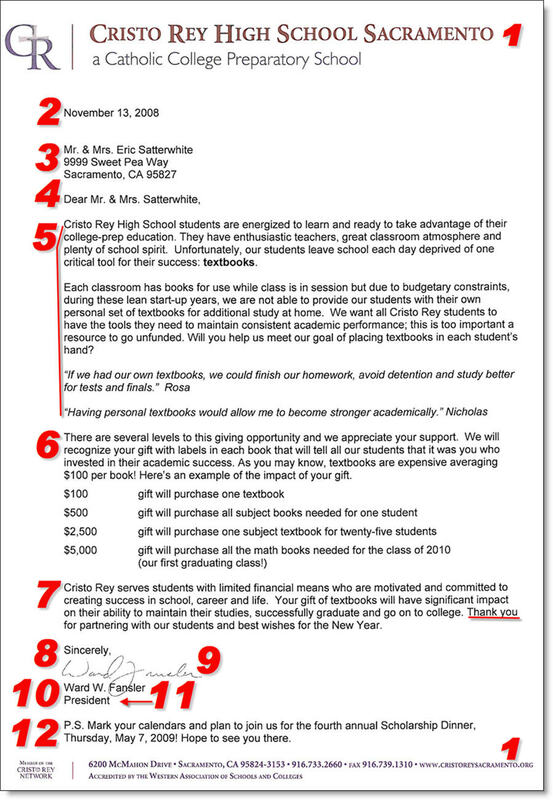 While there are likely many needs at such a school, the letter focuses on one theme, the need for textbooks.Â The reader is drawn in to the story through the colorful description of the classroom environment and through the use of quotations from actual students.Â The reader may imagine in his or her mind what it would be like to try to learn without books. The suggested donations are tied to something tangible, the number of books that can be purchased. So what kind of impact does a letter like this have? Kimberley J. Satterwhite, the school’s Annual Fund Coordinator, reported that the letter raised $45,572.42! By sending out 3200 letters to a highly targeted list (this is a concept we cover in the book) they got a resulting 2.8% response rate and average gift size of $551.53. By the way, this is just one of the letters that is included in the all new 7 Essential Steps to Raising Money by Mail. Call Foundations First: Win More Grants! Fundraising Job Opportunity: Do You Have What It Takes? Whatâ€™s a Non-profit to do When a Tsunami Strikes a World Away? How Do You Raise Money for a Non-profit that Caters to the Well-to-Do? Please assist me to find someone to pay tuition fees for my Daughter (Gift Mugala) who is studying at St Eugene University, Zambia for a degree in Social Work. Hello, I want to write a letter requesting for donation to help young boy and girls between the age of 12 to 18 years to learn dress making and other skills but i don’t know how to go about it. I have a sewing machine. My main aim to to help reduce poverty and teenage pregnancy. I thank you for your immediate response. ?haring this one. A must read post! compared to books, as I found this piece ?f writing at this sit?.